BOSTON – September 6, 2018 – SumTotal Systems, a Skillsoft Company and the world’s only unified learning, talent and workforce management solution, today announced that it was positioned as a “Leader” for the third consecutive time in the Nucleus Research Human Capital Management Technology Value Matrix 20181. SumTotal’s continuous investment in technology innovation, superior focus on user experience, the breadth and depth of its comprehensive HCM suite and its strong content aggregation strategy are cited by Nucleus Research as key strengths of the customer-centric SumTotal HCM product. 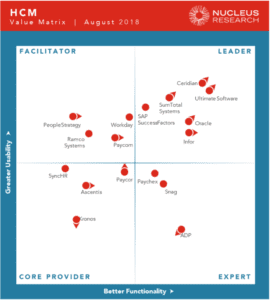 The Nucleus Research Technology Value Matrix provides a transparent tool to help businesses quickly assess a variety of technology solutions based on functionality and usability. Technology vendors that receive designation in the “Leader” category offer technology that is both highly functional and easy to use. Nucleus’ analysis of users’ experiences this past year shows that, “Increasingly, organizations are turning to single suite applications as cross market integration becomes a greater business driver. Organizations need to be able to share and use data in real-time across departments, which remains much easier to do on a single suite.” SumTotal maintains its position as a “Leader” due to its integrated collaboration across the suite and ability to meet growing demand for real-time access to data for decision making from recruiting and onboarding to retention and separation. Built on decades of providing mission critical solutions to the most complex and regulated industries, SumTotal continuously invests in platform innovation to address the challenges of attracting, managing, retaining, developing, paying and engaging today’s multi-generational workforce. Recent enhancements include the launch of a sleek Netflix-inspired design while platform integrations on the back-end provide unification of disjointed business processes, resulting in a seamless experience for administrators. Download the Human Capital Management Technology Value Matrix 2018. 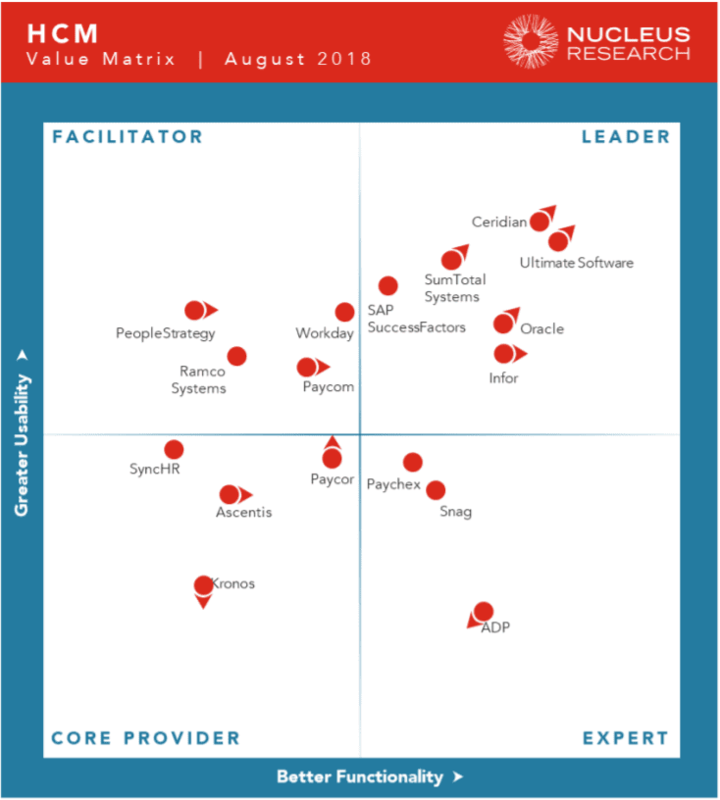 In June, SumTotal also advanced its Leader position in Nucleus Research’s Workforce Management Technology Value Matrix 2018 report.